You have spent weeks, if not months, planning your wedding, but what do you have planned that is going to make it unforgettable? Well, you already know there is no way you will ever forget your wedding. The day you get married is one of the most important days of your life, but what about your guests? Don't you think you should have a little something extra-special planned — something totally different — that gets them involved in your special day in a way they will never forget? If you are ready to go for the gusto, consider incorporating a supply of 36" wedding sparklers from the Wedding Sparklers Outlet into your magical day. One thing you need to know about wedding sparklers is that you often get what you pay for. Some are small and burn for no more than a few seconds before they sputter and burn out. Others, like our 36" wedding sparklers, will last for up to 3 1/2 minutes. 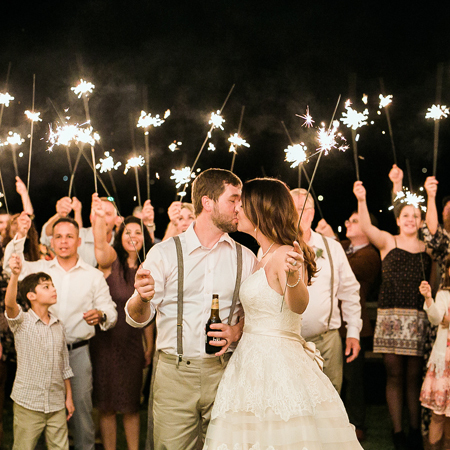 There are so many different ways you can incorporate our wedding sparklers into your celebration. Of course, the most obvious of them is to give them to your guests just before the bride and groom exit the wedding ceremony to form a tunnel of golden sparks for the two of you to pass under. Our 36" wedding sparklers burn virtually smokeless and will shower the bride and groom with golden sparkles that are harmless. They never leave behind any type of residue that could damage your wedding dress or cause injury. They are even considered safe for younger children as long as they are supervised by an older child or adult. This way even the younger members of your wedding party will feel as though they are part of the celebration. The lights go down, the disco ball starts flickering around the room and that magical song that sums up how the two of you truly feel about each other comes on. It's time for your first dance together as a husband and wife. This is always a magical moment for any new couple. But, how do you take your first dance together to the next level? You make sure your guests all have one of our 36" wedding sparklers in their hands and someone to light them all. Since our sparklers burn virtually smokeless, they are safe for indoor use. Your guests will be delighted with the idea of showering the two of you with golden sparks for the duration of the dance. No matter how you choose to light up your wedding with wedding sparklers from the Wedding Sparklers Outlet, be sure to have at least one metal bucket with water in it for your guests to place the burned-out sparklers in. For more information about our complete wedding sparkler selection, our confetti cannons, and our many other special event accessories, please visit our online store and let us help make your special day one no one will ever forget.